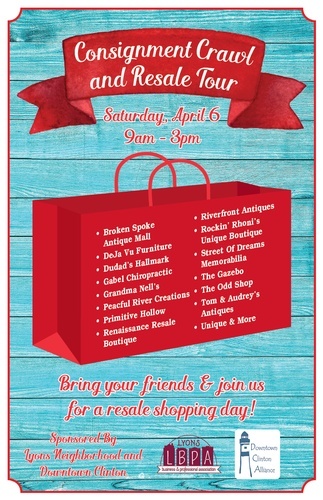 Bring your friends and join us for a resale shopping day! Participating Businesses include: Renaissance Resale Boutique, 2319 No. 2nd Street; Primitive Hollow, 246 5th Avenue South; Deja Vu Furniture, 101 5th Avenue So. ; Riverfront Antiques, 243 5th Avenue So. ; The Odd Shop, 75 Main Avenue; Street of Dreams Memorabilia, 235 5th Avenue So. ; Tom & Audrey's Antiques, 505 So. 2nd Street; Broken Spoke Antique Mall, 2204 No. 2nd St.; Grandma Nell's, 247 5th Avenue So. ; The Gazebo, 256 Main Ave.; Peaceful River Creations, 243 5th Ave. So. ; Rockin' Rhoni's Unique Boutique, 248 Main Ave.; Unique & More, 311 So. 2nd Street; Dudad's Hallmark, 236 5th Ave. So. ; Gabel Chiropractic, 217 6th Ave. So. Sponsored by the Lyons Neighborehood and the Downtown Clinton Alliance.